“For 24,” is a year-long campaign telling the story of Freedom 4/24—from the survivors, world-changers, and volunteers to fundraisers, and behind-the-sceners. Our goal is to inform, inspire, and enrich your understanding of Freedom 4/24 and the work we do together. Griffy came to Christine’s House in July, 16 and pregnant. As a Freedom 4/24 rescue home for exploited girls in Gulu, Uganda, the staff at Christine’s House is used to taking in victims of sexual exploitation and trafficking who are pregnant as a result of their abuse. But Griffy is one of their youngest pregnant girls ever to arrive. She wasn't alone either. At the same time Griffy moved in, another pregnant teen from her village named Filder also arrived. When Griffy and Filder were first identified in their village by Aloysius Kyazze, founding director of Christine's House, both babies were in danger of being aborted. He knew he had to get them to Christine’s House. Christine's House in Gulu, Uganda. Now, Griffy and Filder are safe in a loving community environment. At Christine's House, they are learning a trade and receiving trauma counseling and medical services. Both girls have also been introduced to Jesus Christ and His healing love and hope. Griffy and Filder are flourishing at Christine’s House. Griffy is learning the trade of baking and hopes to become a teacher one day. And she now has her first pupil! Her daughter Patience was born on September 20, a healthy 6.3-pound bundle of beauty. As baby Patience grows, the house now patiently awaits the arrival of Filder’s little one, who is due any day now. Without Christine’s House, both Griffy and Filder would still be in exploitative situations and their babies may not be alive today. Christine’s House is fully funded each year through YOUR support of Freedom 4/24. A donation of any amount helps to provide a bright future to these girls who have survived so much. Gift, at the far left, celebrates with the girls at Christine's House shortly after her arrival in July. 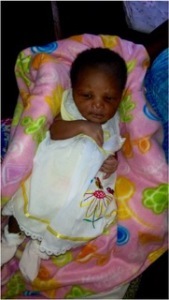 Will you help to invest in the future of girls like Filder, Griffy, and babies like Patience? Begin today by giving a one-time gift or sign up to become a recurring donor.